Aquacleaner Environmental is on the leading edge of technology in the field of Suction Harvesting and Suction Dredging Equipment. Suction Harvesting offers the best short and long-term solutions to controlling and eradicating the spread invasive Aquatic Vegetation and Dredging is no longer a nasty 8- letter word, but rather is a natural step in the restoration of any body of water. Lake Bottoms get soft and fill in through many means, which only helps further their demise. 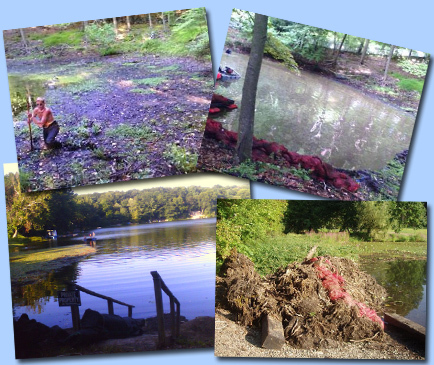 Our equipment and the methodology behind its use offers a real source of remediation to YOUR LAKE PROBLEMS. At Aquacleaner Environmental, our goal is to design, build and implement a new generation of machines that will aid in the reclamation of your Lakes, Ponds and Waterfront properties. We can remove problems that hinder the use of the your waterways, making them more healthy, while remaining conscious of our environment and the need to protect it. Regardless of the nature of each job, our equipment can restore your waterfront property to what it was years before all the debris filled it in. We surround ourselves with the best and brightest specialists in the waterfront restoration industry. Our staff all has personal experience and a passion for the water and the ecosystem it supports.Our equipment is based on fundamentally sound principals in keeping environmentally conscious. We perform various services and sell our equipment only after checking on all legal ramifications and procedures, always keeping in mind the delicate balance that exists between nature and man. Aqua Winch – A portable, self contained winch with motor that can be placed at the waters edge and will pull up to 10,000 lbs items out of the water. When used with our Aqua Claw Rake it can remove large amounts of Cat Tails or other tuber rooted plants. Invasive Aquatic Plants can cause severe problems for the overall health of any lake or water body. Even plants such as lily pads if left unattended can fill an area and choke it to the point where it is of little value to the people that want to use it nor the ecosystem we share it with. Determining ROP – DASH programs can be very successful based on the dynamics involved including the type of plant, height of plant, density of plant and the type of sub straight. The ROP one can expect to achieve is directly related to these dynamics. A single 5” nozzle can work at a ROP of 500 square feet per hour and a double 5” system can work at 1000 square feet per hour. An acre project can be covered in approximately 40 hours. Aquacleaner Environmental will assist your lake in developing a management plan that addresses all aspects of suction harvesting program. Defining the targeted area – We first begin by prioritizing the areas that need work, based on the type of plant, location, density and amount of traffic a given area might have. Type of plant: Rooting System dictates how fast we can remove this year’s plant. Your goal is to get last years plants out as well which are beneath this years plants. The type of bottom – Soft, silted in bottoms will make plant removal and it’s rooting system easier to extract. Hard bottoms like clay or sand will require more suction to get to the rooting system of the plant. The density of the plant both in how many plants are in a given box as well as how tall they are. More Biomass requires more time to go through a given area. The Depth of the water is important because deeper water work will slow your rate of progress due to the logistics of moving around while under water and the size of the plants involved. Define The Other Types of debris in the area to be cleaned. Leafs, stick rocks, zebra mussels, and larger timber must be gone through as part of a shoreline remediation and to maximize your use of the waterfront. A variety of services are available for the homeowners including: Invasive/overgrown plant removal, shoreline remediation (leaves, sticks, zebra mussels, debris), and suction dredging. The Aqua Cleaner operates by sucking up silt and water together and pumping it to a desired location. The most cost effective method involves pumping the material into a field and letting the water and sediment dissipate and be absorbed into the ground. Our second option is to pump the silt and water (slurry) into a dewatering bag that sits on your property. The water slowly leaches out and over a short period of time, the silt contained in the bag will harden and can then be removed. Silt is typically composed of a very pure, organic material (great for composting), which can be spread over your lawn or given to local landscapers or farmers.